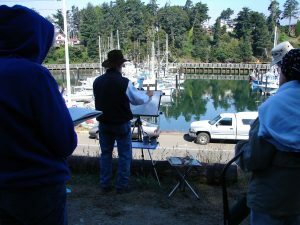 Woody Hansen’s “No Bull” workshops feature watercolor demonstrations, brief lectures, low pressure critiques, expert advice,including handouts, and time for plenty of questions and individual guidance. These affordable sessions are challenging, fun, informative, productive, and appropriately humorous. The demo, painting, and critique atmospheres are relaxed, friendly, and highly conducive to clearly understanding the elements and principles of a better painting, while improving personal self-confidence. These outstanding workshops will help take you to the next level by stimulating the mind as well as the brush. You will learn how the numerous contradictions and “Half-truths” of watercolor can block your creative growth. Plus, beyond the basics, workshop content is flexible and geared toward artistic, self-improvement within a respectful, sharing, group environment. ALL LEVELS WELCOME. MAR. 2-3, 2019. MENDOCINO, CA. 9:30 am to 4 pm each day. All levels welcome. Painting along California’s panoramic Pacific Coast. It just doesn’t get much better than this. Create your personal art while inhaling the fresh air coming off the ocean. hear the comforting sound of the fog horn in the distance. Then, allow yourself to taste the wonderful sea food of nearby restaurants. Don’t get left out of a great weekend of painting. Sign up now. Total affordable tuition: $175 for the weekend. Previous participants, $125 for the weekend. Early registration advised. FOR HELP, or further information? Contact Woody Hansen by way of the CONTACT PAGE. JUN. 22 & 23, 2019. SACRAMENTO, CA. Enjoy the fresh, seasonal, June is busting out all over, time of year! Paint along the beautiful American River Parkway. June is simply a month that invigorates any outdoor painter. Join us for great painting. Total affordable tuition: $175 for the weekend. Previous participants, $125 for the weekend. Free parkway access included in tuition. Indoor facilities available in case of inclement weather. Early registration advised. Enjoy the fresh,late spring, early summer weather! Paint along the beautiful American River Parkway in Sacramento’s ideal June weather. AUG. 03 & 04, 2019. MOUNT SHASTA, CA. There’s nothing quite like mountain fresh air. Paint along the banks of an easily accessible clear, cool, fishable stream, or take in the view of majestic Mt. Shasta, or be fascinated by the nearby scenery of McCloud, or the historic, railroad town of Dunsmuir, California. Each location offers a painter’s delight, and all within minutes of one another. So, do yourself a favor, gather your painting equipment, sketchbook, and register for this outstanding once in a lifetime experience. It will truly be, time well spent. FOR HELP, or further information? Contact Woody Hansen by e-mail (watercolors@woodyhansen.com), or telephone at (916) 383-3427, or by way of the CONTACT PAGE. OCT. 05 & 06, 2019. SACRAMENTO, CA. Enjoy the early fall weather! Paint along the beautiful American River Parkway in Sacramento’s ideal October weather.